The best kind of Valentines are handmade. Come to the studio to make your own Valentine’s Day cards using our buffet of beautiful patterned papers. Please check the Artbeat website for a photo of this project. Projects are designed for ages 8 and older; many are suitable for younger children (ages 4 and up) with a participating adult. 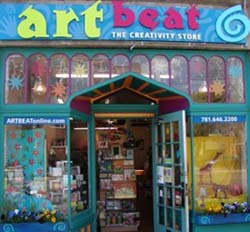 Artbeat is located in Capitol Square in East Arlington, right near the Capitol Theatre.